This one pot creamy angel hair pasta can be made in as fast as 10 MINUTES! It’s done in ONE-POT and tastes incredibly delicious considering how quick it’s made! 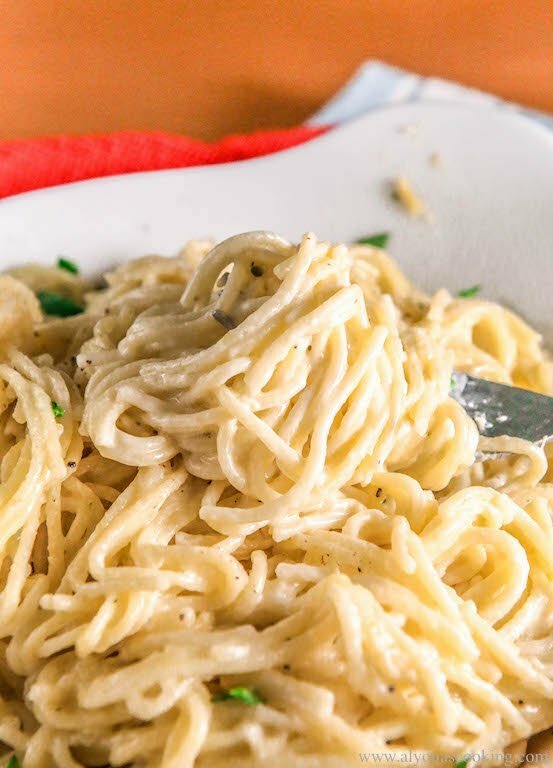 If you want to use thicker pasta check out my One-Pot Alfredo post. Angel hair only requires 6 minutes of cooking, tops! Now add that to however long it takes to fry garlic and the liquid to boil and you have yourself a meal in no time! This can easily be one of those favored meals you can turn to for a quick dinner. I love that it’s made in one pot and no extra frying pans to wash since you don’t even have to make a roux. This creamy and delicate angel hair pasta is one to try! 2. When pasta is done turn off the heat and add the parmesan cheese and cream. Stir thoroughly and serve. Looks delish!! So you don’t need to take the water out after the noodles are done cooking? Nope, the water proportion is just enough to take up the water and cook the pasta.